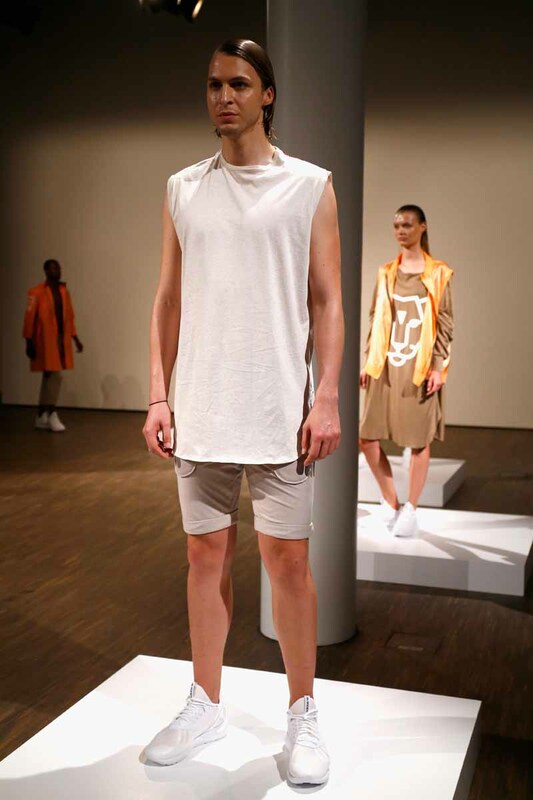 The Alexandra Tamele Spring/Summer 2016 collection presented at Stage at me Collectors Room on July 7, 2015 during Mercedes-Benz Fashion Week Berlin. Alexandra Tamele was born in 1992. The 22 year old, emerging designer studied fashion design at the BEST-Sabel Design School in Berlin where she graduated in 2012. 2014 she was presented at PREMIUM Exhibition, followed by her very first international fashion show at the Black Fashion Week Paris in October 2014. A model poses at the Alexandra Tamele show during the Mercedes-Benz Fashion Week Berlin Spring/Summer 2016 at Stage at me Collectors Room on July 7, 2015 in Berlin, Germany.